CJI staff and volunteers are available to engage and equip community members to handle conflict and relate to each other restoratively. 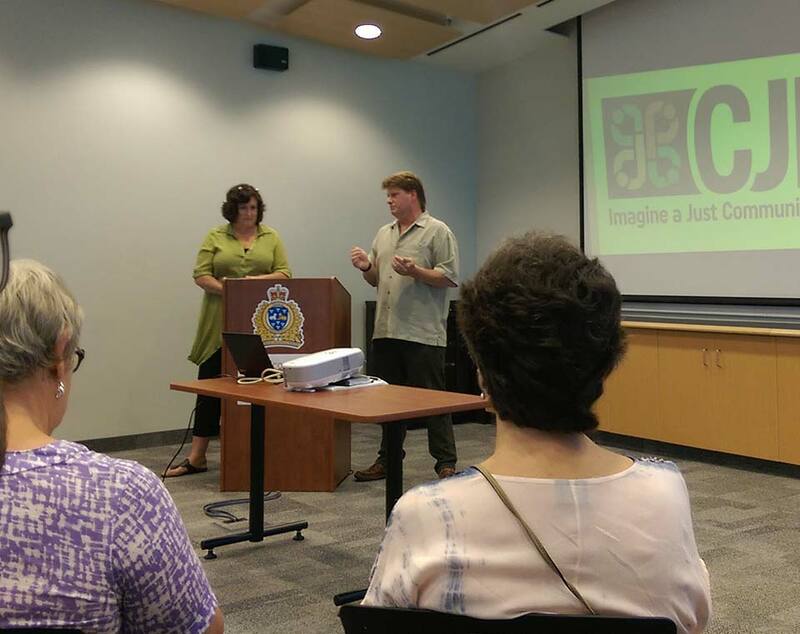 Through presentations and workshops in workplaces, classrooms, and faith communities, at community centres, conferences etc., CJI staff share concepts and tells stories that bring restorative justice principles to life. If you would like a presentation for your group. See the topics below or suggest your own. Contact 519 744-6549 to book a speaker. What is Restorative Justice and How Does CJI Make it Happen? This course explores a transformative model of mediation and offers practical mediation skills that support this approach. Transformative mediation helps cultivate positive changes in the way individuals view themselves, the other participant and their interaction. This approach is particularly effective when the participants feel either that the situation is hopeless or that the other party is unreasonable. The course utilizes a combination of presentations, interactive exercises, role plays, and discussions. When taken at CJI, this course is offered in partnership with Conrad Grebel University College and counts toward their Certificate Program in Conflict Management. The workshops below are available for a negotiated fee and can be designed for different sized groups. Workshop timing and components are flexible based upon the unique needs of the workplace or organization requesting training. Be challenged how to think differently about addressing crime, conflict, and abuse. Wrestle with notions of justice and truth through lecture and discussion. Question what our systems of justice are accomplishing and whether they meet the real needs of victims, offenders, and communities. Emerge with ideas of how to use restorative justice to challenge societal structures and individual experiences. This workshop builds on “Developing a Restorative Justice Worldview” to enable you to live out restorative values in everyday circumstances in your school, workplace, family, and community to become an active peacebuilder. A circle process brings people together for honest communication, relationship development, and conflict resolution. Teachers can use circles to build connections with students, to establish agreements on classroom interaction, and to resolve issues. Through experiential learning, activities, and discussion, participants will learn practical skills to setup and host a circle. CJI can help your school set up a peer mediation program including training teacher mentors and students as peer mediators, developing and monitoring your program, and/or providing CJI co-mediators to work with student mediators. CJI can help your staff work through conflict and/or equip them with conflict resolution tools. One-third of workplace illness is attributed to workplace stressors and the leading cause of stress leave in the workplace is unresolved conflict. CJI’s Workplace Conflict Resolution and Mediation Training can encourage and equip employers and employees to celebrate conflict as a part of a diverse, creative workplace. We offer mediations, conflict coaching, workshops, consultation and facilitation of difficult conversations. A restorative circle process brings people together for honest communication, relationship development, and conflict resolution. Supervisors and employees can use circles to build connections with colleagues, make effective decisions, and to resolve issues. Learn skills to deescalate individuals and situations. Understand your conflict style, how to truly listen, and how to be curious, not right. Develop conflict empathy and respect. Discover the brain science behind conflict. Understand the dynamics of conflict and build your personal and organizational capacity to handle conflict. Learn the skills to communicate unwelcome news without sacrificing the relationship. CJI can tailor workshops to suit your needs. Contact us to explore the possibilities.